​Pedal Power to the Children! In the spirit of National Bike Month, Fargo-Moorhead Community Bicycle Workshop (FMCBW) has organized its first-ever Sponsor a Kid’s Bike event, a month-long donation program for funding the overhaul of used bikes and then giving them to kids in need. The workshop has partnered with the YWCA Cass Clay for the event. The FMCBW will supervise the overhauls and safety checks for each bike, while the YWCA is working to match a perfectly fitting, stylistically catered bike for each child in need. Together, their goal is to prepare as many bikes as possible by May 25, at which point the YWCA will distribute the fixed bikes, as well as helmets, to community kids. However, it is up to the community to fund the actual overhaul of these bicycles. By donating, which can be done at FMCBW or online at fmbikeworkshop.org, the public helps provide the funds needed to fix up each used bike, pay for the necessary parts and ensure a proper safety inspection. Each overhaul requires a $35 donation, but donors are welcome to contribute however much they would like. 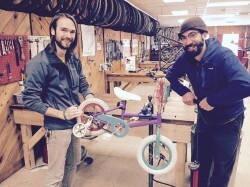 Joe Curry and Joe Alfonso, members of the FMCBW Collective, talked with HPR about how the program is not only a means of funding the repairs needed to get bikes back out to the children who need them, but it also saves used bikes from being thrown out and becoming part of the waste stream. “These bikes are mostly donations from the community, from kids who have outgrown them and can’t use them anymore,” Joe Alfonso told HPR. Curry explained the YWCA’s role in the event, clarifying that it is the crucial other half of the equation. The Hotel Donaldson is also helping out. Throughout May, The HoDo has added an extra tip line to customers’ checks, making it possible for customers to donate to the Sponsor a Kid’s Bike program. Even if only 35 customers donated a dollar each, that would give one more child a bike and helmet of her very own. While the FMCBW has given out fixed-up bikes and helmets to children before, this event does mark the first time it has asked the community to help sponsor the bikes. And, if things go well, Sponsor a Kid’s Bike could become a recurring event.